Want to organize a school trip to Mount Vesuvius? All excursions can be carried out individually or combined with previously scheduled excursions. Do you want to organize a school trip to Mount Vesuvius? Are you a teacher who wants to introduce his students to the beauties and the history of the most famous volcano in the world? Busvia del Vesuvio is a branch of the Torquato Tasso Cooperative of Sorrento which has been entrusted exclusively with tourist transport along the Matrone road, one of the oldest routes of Vesuvius through the appropriate ecological buses. Request info and book online in a few clicks. The Busvia del Vesuvio A unique journey through the Matrone road. To follow this road is suggestive, the sensation is that of being in contact with uncontaminated nature. Busvia del Vesuvio is a branch of the Cooperative Torquato Tasso of Sorrento, which has been entrusted with the delicate task of managing an impressive tourism development program that, launched by the Campania region, has allowed the reopening of the ancient Matrone road to the public. 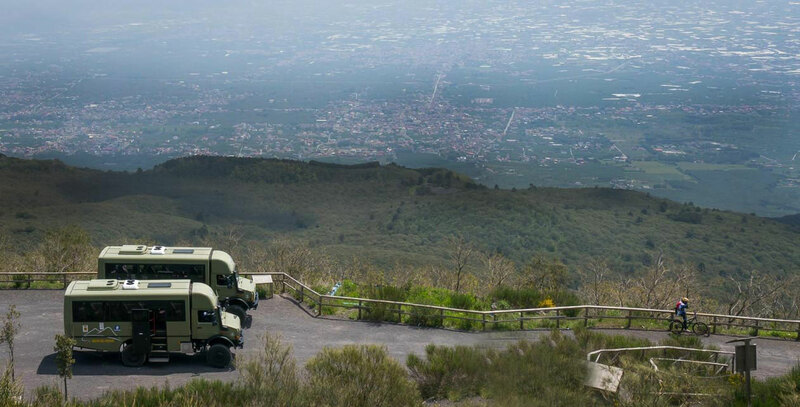 Bring fifty thousand tourists each year on the Vesuvius to the Matrone road, the track built in 1894 by the engineer of Boscotrecase Gennaro Matrone and reopened today, only to the ecological buses of the Park, is one of the objectives of Busviadel Vesuvio. Give yourself one of the most fascinating experiences in the world! A trip to Vesuvius on an ecological bus through the Matrone road. Our tours are dedicated to nature lovers and hikers but also to lovers of history and art. “I had never travelled in a vehicle like this before and never climbed a volcano, especially a world famous bad boy like Vesuvius either, so this really was a one of a kind experience in my life! Seriously, I cannot figure out how some people here are complaining about the bus ride being dangerous, considering the fact that they are crazy enough to climb a dormant volcano, that might just decide to erupt in their faces, while they are at it!